Abel Runeno, 62, starts each day working with three young assistants to take care of a plant nursery at his home. The nursery is one of the 23 he oversees in the Masisi territory in the North Kivu Province of the Democratic Republic of the Congo (DRC). After Abel decided to study agriculture at university, he started planting trees in his father’s and relatives’ fields. But the crisis in the Great Lakes region changed everything. After the 1994 Rwandan genocide, refugees and former Rwandan soldiers fled to eastern DRC. Some went to camps, but others hid in the forests. Refugees needed wood both to cook their food and to sell for money. At the same time, land owners were cutting back trees to create pasture. At the same time, erosion ravaged lands, preventing owners from building houses or cultivating fields. The timing of rains became less predictable, causing farmers to lose much of their production. Facing these consequences of a changing environment, Abel decided to act. He already worked for the government, but he also joined an outstanding network called Reseau des Initiatives locales pour le Développement Durable (REID – Network of Local Initiatives for Sustainable Development). He still works with them today. According to latest statistics, REID planted more than 500,000 trees between 2008 and 2014! The incredible impact of Abel’s work and that of his colleagues is visible throughout the area. Kapataro is an agriculturist living on hills where some of these trees were planted. He stresses that trees do more than just provide material for houses. Ombeni Faustin, a pastor in a local church, and his family live in the same neighborhood. “A rock fell from the mountaintop, brought by rain water. Luckily, it got blocked by trees just up here. Without trees, I and my family would have died.” He says he would have to leave the area if anyone decided to cut down all the trees. 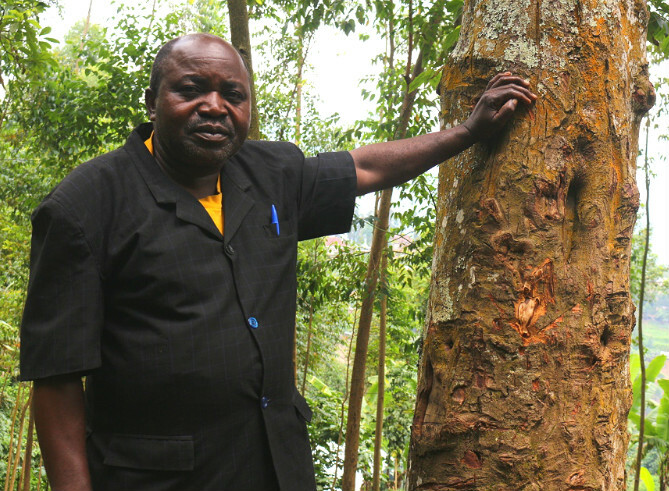 Abel Runeno and other members of REID plan to plant even more trees on the hills in Masisi territory. As most of people in the area cultivate their fields, REID also promotes agroforestry and responsible use of trees in the area. The group hopes to widen their impact by training more young people to continue with these amazing initiatives! THIS is why the #GlobalGoals are so important. Get involved and take action TODAY.